GitLab CE edition is a free open-source tool that will help us to host Git repositories and run our CI/CD pipeline. To keep it simple, we will install GitLab on an ECS instance with a direct access to internet. Although the servers will be protected via encryption and restrictive security group rules, you might also want to isolate your virtual machines from internet by using a VPN Gateway. Choose a domain, such as my-sample-domain.xyz and follow the instructions to buy it. Return to the console and refresh the page in order to see your new domain. Note Due to a limitation in Direct Mail, choose a domain name with less than 28 characters. Log on to the VPC console. Select the region where you want to create the VPC on top of the page, for example, Singapore. Click OK the create the VPC and the VSwitch. In the VPC list, click the VPC you have just created. Scroll down and click 0 at the right of Security Group. In the new page, click Create Security Group. Click OK to create the security group and the rules from the template. Note that the rules open the ports for SSH, HTTP, HTTPS and ICMP to any computer on Internet. Go back to the console, click Instances from the left-side navigation pane, and select a region. Now you can see your new instance. Click Buy Now, check the agreement of service, and click Activate. Go back to the console and check your new EIP. Click OK to bind the EIP to your ECS instance. Copy the IP address of your EIP (for example, 47.88.155.70). Note If you use MAC OSX, you must first disable the setting Set locale environment variables on startup in Preferences > Profiles > Advanced. In the GitLab configuration file, replace the value of external_url by http://gitlab.my-sample-domain.xyz (the domain you have just purchased and configured), and then save and quit by pressing Ctrl + X.
Congratulation if you get a similar screen! In case it does not work, first make sure you did not miss a step, and then raise an issue if the problem persists. Do not enter your new password yet because you are using an unencrypted connection. Now fix this problem. Modify the value of external_url by adding an s to http:// into https:// (for eample, https://gitlab.my-sample-domain.xyz). Check it worked by opening your web browser to https://gitlab.my-sample-domain.xyz (with the s in https). You can now enter your new password and sign in with the username root and your new password. You can now access to the GitLab dashboard. An email server so that GitLab can send emails. Automatic backup in order to avoid loosing data. Note Direct Mail is not available in all regions, but you can configure it in a different one from where you have created your ECS. At the time of writing, Direct Mail is available in China (Hangzhou), Singapore and Australia (Sydney). Contact us if you need it in another region. Log on to the Direct Mail console. Select the region on top of the page. Click Email Domains from the left-side navigation pane. In the new form, set the domain as mail.my-sample-domain.xyz (the domain you chose earlier with the prefix mail). The page must be refreshed with your new email domain. Click Configure link on its right side. The new page explains you how to configure your domain. Keep this web browser tab opened, open a new one and go to the Domain console. Click Resolve link next to your domain. Click OK and click Add Record again. Go back to the Direct Mail console (the web browser tab you kept opened). Click Cancel to go back to the email domain list. Click Verify next to your new domain, and confirm when the prompt appears. Refresh the page after 20 sec. If the status of your domain is still To Be Verified, click Configure and check which step is still in the To Be Verified status, fix your domain configuration and re-do the previous step (Verify). Sometime the verification step is a bit slow and you need to retry several times. When the email domain status is Verification successful, you can continue to the next step. Click Sender Addresses from the left-side navigation pane. Your new sender address should be added to the list. click Set SMTP password next to it. Set the SMTP password and click OK.
Click Verify the reply-to address next to your new sender address, and confirm when the prompt appears. Check your mailbox corresponding to the address you set in the Reply-To Address field, you should have received an email from directmail. Click on the link in this email in order to see a confirmation message. Go back to the sender addresses page and save the SMTP address and port at the end of the description, it should be something like SMTP service address: smtpdm-ap-southeast-1.aliyun.com . SMTP service ports: 25, 80 or 465(SSL encryption). Click Admin area in the top menu (the wrench icon). Click Users from the left-side navigation pane. Change the Email field to your personal email address. Sign out by clicking on your profile picture on the top-right of the page and by selecting Sign out. Set your personal email address and click Reset password. Check in your personal mailbox and verify you have received an email (it may be in the spam folder). Backups are important because they prevent data loss in case of accident and allow you to migrate to another ECS instance if you need. Note The GitLab documentation requires tar version to be equals to or later than 1.30. The page must show the bucket you have just created. Save the last Endpoint for VPC Network Access (something like oss-ap-southeast-1-internal.aliyuncs.com). It contains your bucket name and the region ID, for example, ap-southeast-1. Log on to the user management center by clicking on your user on the top-right of the page and by selecting AccessKey. Note the AccessKeyID and the AccessKeySecret and click Save AccessKey Information. Click your bucket name from the left-side navigation pane. Click Files from the top menu. The file test.txt should be present and should contain It works. Log on to the OSS console, and check that the test2.txt file is present in your bucket and delete it. The last command should have created a backup. Log on to the OSS console and check you have a file with a path like backup/1540288854_2018_10_23_11.3.6_gitlab_backup.tar. Let’s now configure automatic backup to be executed automatically every night. For that we will create two types of cron jobs: one to execute the backup command above, one to save the GitLab configuration files. # Edit the CRON configuration file. Select nano as the editor. 0 2 * * * /bin/cp /etc/gitlab/gitlab.rb "/mnt/gitlab-bucket/backup/$(/bin/date '+\%s_\%Y_\%m_\%d')_gitlab.rb"
0 2 * * * /bin/cp /etc/gitlab/gitlab-secrets.json "/mnt/gitlab-bucket/backup/$(/bin/date '+\%s_\%Y_\%m_\%d')_gitlab-secrets.json"
Save and quit by pressing CTRL + X. You now have configured automatic backup every night at 2AM. If you want to test this configuration you can replace 0 2 * * * by the current time + 2 min. for example if the current time is 14:24, then set 26 14 * * *. after that you need to wait about 2 min and check whether new files have been created in your OSS bucket. The restoration process is well described in the official documentation (section Restore for Omnibus installations). Note that it is considered as a best practice to test your backups from time to time. It is a best practice to run CI/CD jobs (code compilation, unit tests execution, application packing, and so on) on a different machine from the one that run GitLab. Select the region of the GitLab ECS instance (on top of the screen). Click 1 next to Security Group. Click OK to create the group. We will not add any rule in order to be as restrictive as possible (to improve security). Go back to the ECS console, select Instances from the left-side navigation pane and choose your region on top the screen. you should be able to see your new instance devops-simple-app-gitlab-runner. Click Connect on the right of your ECS instance, copy the VNC Password (something like 667078) and enter it immediately after. You should see a terminal in your web browser inviting you to login. Authenticate as root with the password you have just created. As you can see we setup two applications: GitLab Runner and Docker. We will keep things very simple with Docker: it is a very powerful tool, but for the moment we will just use it as a super installer, for example we will not setup any tool, compiler or SDK on this machine. instead we will be lazy and let Docker to download the right images for us. Things will become more clear later in this tutorial when we will configure our CI/CD pipeline. Open GitLab in another web browser tab (the URL must be like https://gitlab.my-sample-domain.xyz/). Click Admin area from the top (the wrench icon). Click Runners from the left. Open GitLab in your web browser (the URL must be like https://gitlab.my-sample-domain.xyz/). Click your avatar on the top-right of the page and select Settings. Correctly set the Full name and Email fields and click Edit profile settings. Click Account from the left. Change your username and click Update username, and then confirm it again when the prompt appears (this step improves security as attackers would have to guess your username in addition to your password). Click Settings from the left. Expand the Sign-up restrictions section. Uncheck the Sign-up enabled field. Now only administrators can create new users. This can be done by navigating to the Overview > Users in the Admin area. Linux servers need to be upgraded from time to time: security patches must be installed as soon as possible and applications should be updated to their latest versions. Other commands such as apt-get dist-upgrade or do-release-upgrade are less safe, especially the last one since it can update Ubuntu to a newer LTS version that is not yet supported by Alibaba Cloud. Create a backup of the existing GitLab data. Create a new ECS instance and install GitLab. Note The GitLab version on the new ECS instance must be the same as the old one, if not the backup-restore process fails. Restore the backups into the new machine. Check the new instance works. Unbind the EIP from the old ECS instance and bind it to the new one. Release the old ECS instance. # Check the default configuration is fine for you. Press CTRL+X to quit. The logs of unattended-upgrades are printed in /var/log/unattended-upgrades. More information about automatic update can be found here. When pipeline jobs take too much time to run, maybe adding more runners or using ECS instances with higher specs can help. When GitLab itself become slow, the simplest solution is to migrate it to a stronger ECS instance type. 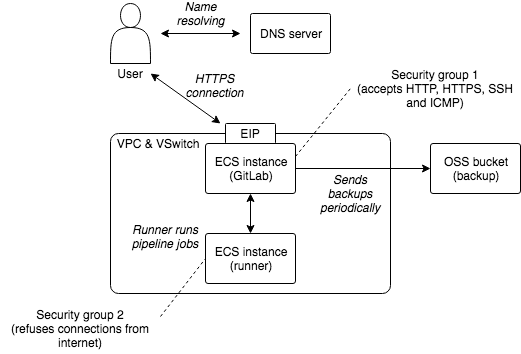 A server load balancer to distribute the load across ECS instances. A NAS to let multiple ECS instances to share a common file storage system. As you can see the complexity can quickly increase. Tools such as Packer (virtual machine image builder), Terraform (infrastructure as code software) or Chef / Puppet / Ansible / SaltStack(configuration management) can greatly help managing it: they require an initial investment but allow organizations to better manage their systems. Another solution is to let other companies to manage this complexity for you. There are many SaaS vendors such as GitLab.com or GitHub. Alibaba Cloud offers Codepipeline, but it is currently only available in Chinese.